Well, it’s almost junior year and that means that I will officially have the least preference in NYU’s housing placement (sophomores receive the highest, then seniors). It also means that if I stay in “on-campus” housing, I am likely to end up a significant distance away from campus while still paying exorbitant amounts. Lafayette Hall (which holds the title for most inconvenient commute) works out to be a little over $2,000 a month and that’s for a “shared bedroom.” Sadly, this crippling figure is the accepted norm for junior residence hall prices even if you are lucky enough to dodge the Lafayette bullet and get into Carlyle, Coral, Greenwich Hotel, Gramercy, Palladium, or U-Hall. But I don’t want half a room for $2,000 a month. I want a quality space to myself – a place that I feel a connection to; a place where I may hang my hat without my coat rack being indicted as a fire hazard; a place that I have thought deeply about and am proud to show to friends and family. I look around the dorm housing and I see brightly colored walls and phrases one might see on a Lunchables box like “Fuel Up With Healthy Snacks!” These are not the birthplaces of self-sufficient adults. They are the nurseries of boarding school children. These are the places where we have to ask, “May I sign my friend in?” and are immediately scrutinized as if we are delinquents. These are the places where we pay more for restricted freedoms; where the decision of location and amenity is not made based on convenience or practicality but rather on a roulette-style gambit. Additionally, living “off-campus” can save you the stress of moving. Got a job or an internship over the summer? 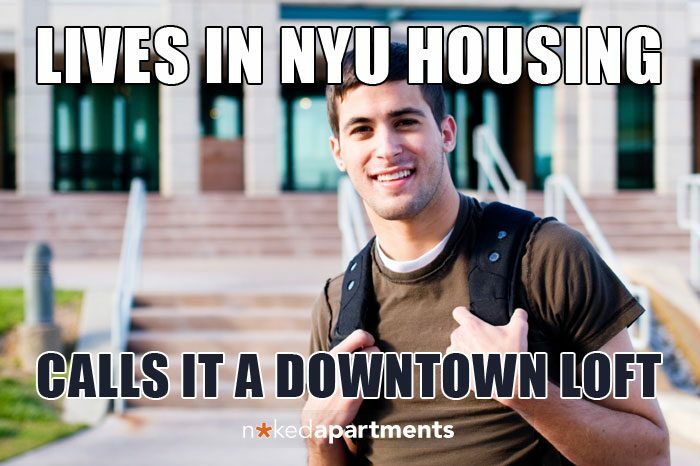 NYU will send you a soulless email telling you to get out by mid-May if you’re in on-campus housing. But in an apartment, you can stay for as long as you agree and in a location that you choose. And after a long day, apartment-dwellers can feel free to enjoy a responsible social lifestyle without the impending presence of patrolling Resident Assistants. It’s no secret that living in an apartment is, more often than not, significantly cheaper (we’re talking hundreds of dollars per month) and more convenient than living in on-campus housing. 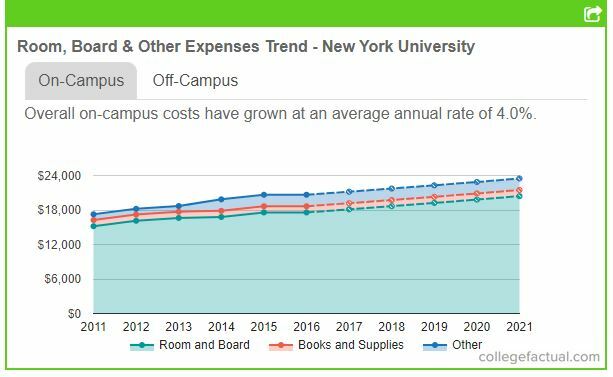 Alumni Hall charges around $2,700 per month just so you can have your own room. Using Naked Apartments, I found over 160 current listings that are closer to campus than the common junior-year residence halls and where I can have my own room. These listings boast rent at two-thirds the cost of the average dorm situation while still maintaining spaciousness and important amenities like a laundry room or a dishwasher. Yep. I think it’s time to move off-campus. You can always look about $100-$150 outside of your price range because they negotiate. I think it is best to think about your lifestyle when getting an apartment. How far is it from school? Will you have an internship? If so, is it close to a train to get there… because if it is not, it makes it really hard to get up to a job. Being close to a subway is key a lot of times. Look for somewhere with light, a bright apartment makes it much easier to feel at home, you can always put up curtains but that light is essential. I would say go for a high floor because you get a nice breeze when it is hot in the summer as opposed to the street air if you are on a lower floor. Make sure that the real estate agent has an office – I used citi-habitats.com for mine – just don’t do any sketchy deals – this is a lot of money to be handed over so don’t be stupid, that is good advice. LAUNDRY ROOM IN BUILDING IS SO IMPORTANT. Also, visit the area during the day when you see the place, and at night – you can see the real character of the neighborhood at night. For example, I live on Christopher Street. It is gorgeous during the day, tourists, locals, fashionable people. It’s great. BUT at night sometimes it is really obnoxious and a little scary. SO on like a Tuesday/Thursday do that because that is the night when the local people would be in the area. I am actually looking for a new apartment so I am going through the process. When I first sought the refuge of off-campus housing, I saw more than 15 apartments before I found “the one.” Compromise is key when apartment hunting. You’ll find a nice-sized bedroom in an area that’s not your favorite; a place with a kitchenette in your ideal NYC hood; the list goes on. Prioritize your wants and needs and make sure your roommate(s) have the same or similar wants and needs. The only time you will reside in your ideal Manhattan apartment is when you possess an American Express Black Card. Or if you want most of the things you want in an apartment there’s always Bushwick. Rule 1. Calculate your budget. Don’t forget to include water, heat, electricity, cable, etc. Try not to estimate. Create a budget and make sure you stick to it. Don’t begin looking at apartments that are out of your price range. You’ll complicate your life. Through websites, you’ll be able to explore which areas your budget will allow you to search in. Rule 2. Familiarize yourself with a map of New York City! It wasn’t until I arrived that I realized I was completely lost. I found myself standing in the middle of the sidewalk like a fish out of water. Chelsea is no longer the name of your high school sweet heart and Houston is no longer pronounced like the city in Texas. When looking at a specific apartment, explore its neighborhood. For example, if cooking is important to you, then make sure to check where the nearest grocery store is. Also, keep in mind where your class and/or work is and check if there is a near enough subway stop with the appropriate train. Rule 3. If you’re not using a broker, then make sure your online source is a reliable one. Craigslist works, however, half of them are scams. If a listing on Craigslist asks for a broker’s fee, then run the other way; definitely a scam (This does not apply to more reliable online sources). Rule 4. Keep an open mind! New York City housing market is unlike any other. You will most likely need to compromise on some things in order to receive another. For example, if you want great location, expect to compromise on square feet and possibly quality. The same applies to the reverse. Be sure to ask questions about each property! Sometimes water/heat are included. Also, do your research on guarantor policies. Like I said, NYC is unlike any other, and requires high salaries (40x the rent to be exact). If you don’t meet the percentile, then many apartments allow the use of guarantors. In other words, you must prove that your parents make 60x and sometimes 80x the expected rent. Rule 5. Don’t become overwhelmed. Some of the places you’ll see will be scary. Look at as many apartments as needed. Trust me, you’ll know which apartment you want when you see it. Every other apartment will have pros and cons, but there will be one apartment that fits you perfectly, despite its cons. You’ll know it as soon as you see it. Act fast! New York is known to have apartments go on the market one day, and off the next. If you see something you love, don’t hesitate! After a little trial and error, you’ll be right on your feet. Try not to get too stressed. This is most likely the first step to a new chapter in your life. Last tip: once settled into your new apartment, don’t try to decorate it all in one weekend. Things will begin to fall into place over time. Make it fun!